The Hippocrates Circle program helps youth from under-represented communities and diverse backgrounds realize they can pursue a career as a physician. 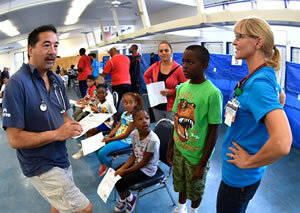 Through the collaborative efforts of the local school districts, medical schools, and doctors and staff from Kaiser Permanente’s Southern California region, Hippocrates Circle helps to bolster self-esteem in participants and outline a path to success. The selected individuals enrolled in the Hippocrates Circle will have several opportunities in their fellowship to interact with practicing physicians. The mission of the STEM Academy is to instill a love of scientific inquiry and application and to empower students to pursue higher education by learning in an interdisciplinary and contextualized learning environment. Medical interns and residents mentor science, technology, engineering and mathematics students on campus and in the hospital. Students receive hands-on medical experiences, such as surgery simulations on mannequins. Mobil Van used to engage community in difficult to access sites.